The year 1893 gives us the first known record of then-Texas A&M College’s Glee Club, originally made up of nine students and faculty from the college. As the club entered the 20th century, membership grew modestly from the original nine to a club of 21. They also began traveling across Texas and the United States trying their luck at singing competitions. (There is no record of success from said competitions.) In 1908, the director of the club left the college and involvement started to fizzle out. Two years later the college decided to hire Frank D. Steger for the task of reorganizing the club “for the development of individual talent, and for furnishing music in Chapel Services, Easter, Commencement, and other similar occasion.” Despite already having a lot on his plate (Steger was also the director of the local YMCA), the college must have been pleased with his direction. Thus, in 1911, A&M hired Steger as its first-ever head basketball coach. In the context of college basketball’s infancy, Steger had a solid career, winning 22 of his 28 games from 1912-15. However, despite that early success, the school we now know as Texas A&M University hasn’t been able to win 20 or more games, go deep in NCAA Tournaments, send players to the NBA or even keep head coaches in College Station at a consistent rate. Picture college hoops during the mid-to-late 20th century. Television was taking the sport to the next level and coaches had became synonymous with their schools — Dean Smith at North Carolina; Bob Knight at Indiana; John Wooden at UCLA; Al McGuire at Marquette. The financial pressures for success were different in those days, and at a football-first school like A&M, competitive basketball was often good enough. 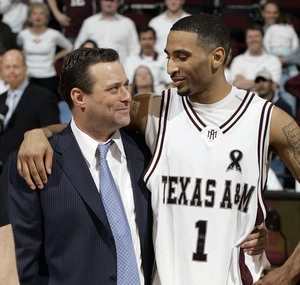 Shelby Metcalf was certainly that in College Station, coaching the Aggies to six Southwest Conference (SWC) regular season titles, five NCAA Tournament appearances and two Sweet Sixteens in his 26+ years at the school. Despite his infamous firing midway through the 1989-90 season, Metcalf is the longest tenured coach in the history of SWC basketball. After he was terminated, the program so disastrously spiraled through most of the next 15 years that there was hardly a pulse left. Then Billy Gillispie arrived on the scene. Danny Spewak is a Big 12 microsite staffer and an RTC correspondent. You can follow him on Twitter @dspewak. Three days ago, the loss of Billy Gillispie‘s employment at Texas Tech seemed like a formality. On the heels of a series of articles from a local Lubbock newspaper, ESPN.com and CBS Sports — in which former and current players said he violated NCAA practice regulations and forced a player with a stress fracture to run stairs — it seemed he’d probably never coach college basketball again, especially in light of his “second chance” following the whole Kentucky fiasco. On Friday, I defended Gillispie’s right to tell his side of the story, arguing media reports had smeared him as he sat in a hospital without any way of responding to the accusations. No reporter had even attempted to write a balanced story, and Gary Parrish of CBS called for the school to fire Gillispie because “there’s no reason to believe” the allegations against him aren’t true. Since then, Deadspin has already reported the school will dismiss Gillispie, though no other outlet has confirmed that claim at this time. It’s bad, folks. Real bad. So thank goodness for Jason King. ESPN.com’s senior writer used his connections over the weekend to write a brilliant piece on the Gillispie situation, offering an entirely different side of the tale from the coach’s supporters. On Friday, I asked somebody to call Robert Lewandowski. Apparently, King already had: By Saturday, he appeared in King’s lead, and he stood behind Gillispie by describing him as a tough-love leader, not a madman. Former Texas A&M star Acie Law and forward Joseph Jones said the same thing about their former coach, as did Josh Harrellson (Kentucky) and Deron Williams, who signed at Illinois during Gillispie’s time as an assistant in Champaign. King also garnered a response from Bill Self, a former coaching partner of Gillispie’s, along with Texas Tech color commentator Andy Ellis, who serves as perhaps King’s strongest and most outspoken source. “Somebody needs to tell the other side of the story,” Ellis said. That’s all we’re asking for, and Jason King does a heck of a job doing just that. To be clear, he does not exactly exonerate Billy Gillispie. Ellis points out that former players would of course have a vendetta against Gillispie after transferring, but current players still met with the athletic director about their coach’s conduct and the situation is far from resolved. Lewandowski partly disputed the troubling tale of Kader Tapsboa crying as he ran stairs with a stress fracture, but he offered a fairly vague statement in an effort not to undermine his teammates. 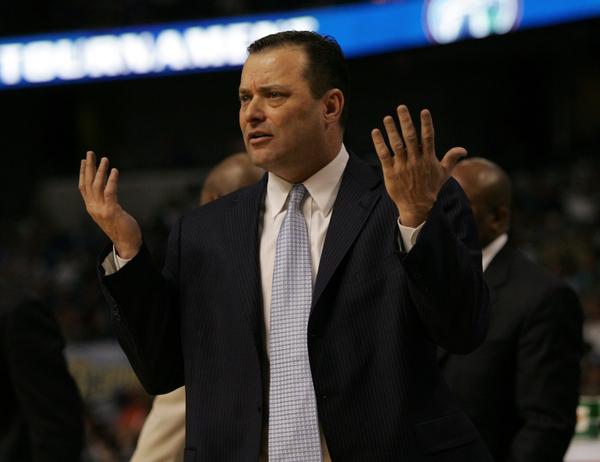 Gillispie still may have violated NCAA rules, but after King’s story, at least he’ll get a fair shake. The piece even led to a follow-up from the Lubbock Avalanche-Journal, shedding even more doubt on the matter. Game of the Day. BYU 78, #6 Louisville 76. Due to familial obligations, we didn’t get to see this game tonight, so chime in if you did, but the result here didn’t shock us. On Wed. night we caught a good portion of the Cards’ game with UNLV, and even though they ended up winning by 20, it was an ugly performance. BYU is significantly better than UNLV, and the tournament site of Las Vegas, while culturally a million miles away from Provo, is still familiar Mtn West country for the Cougars. So what happened? Well, BYU forward Jonathan Tavernari (29/7 with 5 threes) and center Trent Plaisted (21/12) essentially took over the game for the Cougs in the second half, accounting for all but six of BYU’s points. Louisville got twin dub-dubs from Derrick Caracter (24/11) and Terrence Williams, but the missing men tonight for the Cards were guards Andre McGee and Edgar Sosa (3 pts combined in 39 mins). UL just isn’t going to be the same team without some kind of inside presence besides Caracter. They need Palacios to come back healthy (at a minimum) if they expect to compete for a F4 berth this year. BYU, on the other hand, appears to be completely back from the nadir (9-21) it reached in 2005 – all credit to coach Bob Rose for their reconstruction to a legitimate MWC contender and national presence again. Oh, and this loss also ruined our most anticipated early-season matchup between Louisville and UNC – thanks for that, Brigham Youngsters. Other Games We Saw. Texas A&M 70, Ohio St. 47. The most impressive win of the night was in the PNIT finals. TAMU put a defensive clinic on in the second half of this game to blow open a close halftime score (31-25) to a thirty-point evisceration with ten minutes remaining – the Aggies held OSU to only one FG in the first 11.5 mins of the second half! We haven’t seen a defensive shutdown against a quality opponent like that since Georgetown was willing itself into the F4 last year. If this is any indication of how A&M is going to play defense the rest of this year, then everyone (including us) has severly underrated Mark Turgeon’s team. Kosta Koufos, who on Wed. night looked fantastic against Syracuse, was held in check (10/5 on 4-16 FGs) and the whole Buckeye team shot a miserable 24% for the game. A&M was led by Derrick Roland (15 pts) off the bench, but the player who really caught our eye tonight was freshman center DeAndre Jordan (11/8). That beefy front line of Jordan, Josh Carter and Joseph Jones is going to present a lot of problems for people this year. Syracuse 91, Washington 85. In what was a pretty exciting game at times, the Syracuse freshmen showed up tonight to lead the Orange past Washington. Donte Greene had 25/10/4 assts/3 blks in an all-around showcase of skills, and Jonny Flynn got off the schneid with 16 pts in 21 minutes of play. For Washington, Quincy Pondexter had an array of nasty moves to get his 20/13, but poor D in the form of incessant fouling led to the Cuse taking 52 foul shots (v. UW’s 19 attempts). Washington had four players foul out of the game, but their rebounding advantage (+25) kept them in the game – UW nearly had as many offensive rebounds (24) as Syracuse had total rebounds (27). Guess this is how it’s going to go for Syracuse this season – when the freshmen play well, they win; when not, they don’t. As for Washington, we still can’t figure them out. We just have this sneaky feeling that they should always be a little better than they are. #2 UCLA 81, Yale 47. Bruins shoot 55% in easy win. #3 UNC 99, Old Dominion 82. Roy’s technicolor tie distracted us, but we found it interesting that ODU missed two layups at the end that would have covered the spread (in Vegas). Lawson’s speed was sick this game. #7 Tennessee 74, West Virginia 72. Didn’t get to see this one, and sorry we missed it. It appears that Huggins’ guys took it right at UT’s softies, though. #8 Washington St. 66, Montana 55. Taylor Rochestie led Wazzu with 17. #9 Indiana 70, Illinois St. 57. E-Giddy with 31 in a nice win for the Hoosiers. DJ White only 4, though? #13 Texas 102, New Mexico St. 87. Abrams and Augustin combine for 56. #17 Butler 84, Virginia Tech 78. If Butler wants respect, it needs to do better than barely beating an ACC bottom-feeder. #18 S.Illinois 63, Mississippi St. 49. Paging SEC:TGTBTD, didn’t you guys predict 26-4 for MSU? You’ve got two left. #19 Kansas St. 73, UCF 71. Ho-hum, Beastley with another 30/13. #20 Pittsburgh 92, Buffalo 45. Pitt continues to roll early. #25 Villanova 84, George Mason 76. Great game – GMU will be dealt with in the CAA this year, but the Nova guards were too much today. Rider 82, Penn St. 73. Ugly loss for the Big 10 (Jason Thompson 21/10/3 blks). NC State 63, South Carolina 61. NC State is not a good team, people. Bradley 67, Iowa 56. Great MVC win v. a B10 team. Florida St. 65, Florida 51. This was in Gainesville – looks like Billy D’s team got a wakeup call with their worst loss in 3 yrs. Virginia 100, Penn 85. Another nice road win for UVa. USC 57, Miami (OH) 53. USC looks bad again – Gibson with a mere 6 pts (Mayo w/ 21). On Tap Today (all times EST). Mostly pigskin on the tube, but as always, there are a few jewels in the lineup. Air Force (-1) v. Montana 4:30pm – solid mid-major matchup. Tennessee (-5.5) v. Texas. this is a game worth watching – should be very uptempo. Wisconsin (-9) v. Georgia 6:30pm – odd non-tourney game between B10/SEC – could get ugly for Dennis Felton. Pacific v. St. Louis (-6.5) 8pm – another solid mid-major contest. Louisville (-9.5) v. Old Dominion 7:30pm. Based on what we saw tonight, ODU will beat Louisville unless the Cards play better than their previous two LV games. Indiana (-2.5) v. Xavier 8:30pm. IU’s first real test of the year. Vanderbilt (-4.5) v. Bradley 8:30pm. can Vandy keep it going so easily? Oregon (-18.5) v. San Francisco (ESPN FC) 10pm – Oregon gets a chance to take out its St. Mary’s loss on another WCC team. Nevada v. UNLV (-3) (ESPN FC) 10pm – intrastate rivalry! UNC (-8) v. BYU 10:30pm – not the preferred matchup, but still a very good one. Texas Tech v. Butler (-5) 12:30am. Butler could use this one in Alaska. Should I stay… Cal’s DeVon Hardin, Marquette’s Dominic James, Nevada’s Marcelus Kemp, Illinois’ Shaun Pruitt, Texas A&M’s Joseph Jones and GW’s Maureece Rice will stick around another year to play for free. Or should I go? Georgetown’s Jeff Green, Georgia Tech’s Thaddeus Young, Nevada’s Ramon Sessions, Oklahoma State’s JamesOn Curry have all decided to keep their names in the draft. In case you missed it, Florida guard Brandon Powell was arrested last week. We thought this was kinda cool: Kareem‘s commencement speech at UCLA last weekend. Oden is faster than Durant in the 3/4-court sprint, quicker in the lane-agility drill, and has better numbers in the running and standing vertical leaps. And, Oden has a mind-boggling 7.8 body-fat percentage … most big men are north of the 12 percent range. For instance, other top-rated big men such as Washington’s Spencer Hawes (13.0), Duke’s Josh McRoberts (13.7) and Pitt’s Aaron Gray (10.8) don’t compare. […] Oden is 6-foot-11 without shoes, 7-feet with shoes. He weighs 257 pounds. His wingspan is 7 feet, 4.25 inches (fourth best in the draft). His standing reach is 9 feet, 4 inches (the highest of anyone in the draft). His standing vertical is 32 inches, his running vertical 34 inches. For a big man, these numbers are sick, as he outperformed the smoother and more fluid-looking Durant in every athletic category. What this essentially means is that Oden has guard-like athleticism (not to be confused with guard-like skills – see: KG) as a traditional back to the basket seven-footer. No wonder the scouts have been drooling over this guy since he was in ninth grade. There shouldn’t have been much question, but if there was any at all, these athletic numbers will put to rest the notion of Portland taking Durant over Oden in about three weeks. Georgia Tech’s Javaris Crittenton going pro but will not hire an agent. Despite early reports to the contrary, Brandon Rush is still undecided about leaving Kansas for the NBA. His frontcourt teammate, Darrell Arthur, is apparently staying for his sophomore year. Clemson’s James Mays also will test the waters. Who are these guys? Texas A&M’s Joseph Jones also declares. This is a hoax, right? 7’3 Jason Bennett of Kansas St., who averaged 1.9 ppg last year, is going pro. Finally, some sanity. Luc Richard Mbah a Moute & Darren Collison announced they were both returning to UCLA next season.